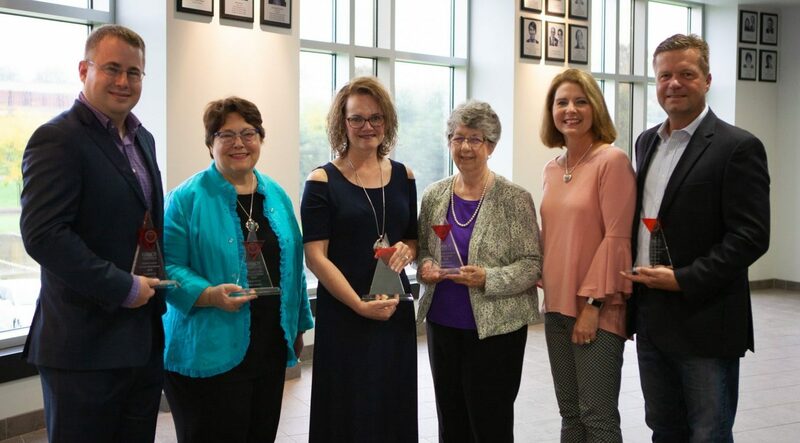 Grace College and Seminary 2018 Alumni Award recipients, left to right, Patrick Lee, Suzie Light, Dr. Kelly Manahan Geisler, Janet Minnix, Renee Keiser, and Dan Keiser. Grace College and Seminary, Winona Lake, Ind., recognized six distinguished alumni and friends at its annual Homecoming Chapel on Oct. 5. Dr. Kelly Manahan Geisler, Suzie Light, Janet Minnix, Patrick Lee, and Dan and Renee Keiser were honored for their accomplishments and contributions to Grace and to their communities. Each of the men and women awarded has served to advance the mission of Grace College & Seminary through their lives and careers. Kelly and her husband, John, have been consistent advocates and supporters of Grace College for many years. Kelly has given of her time by serving on the Aspire Campaign Cabinet and offering her expertise to Grace students who are interested in attending medical school. In recognition of their financial contributions to the new Dr. Dane A. Miller Science Complex, a biology lab will be named in the Geislers’ honor. “Kelly has been a true asset to the college as we launched and worked to fulfill the largest capital campaign in Grace history,” said Dr. Bill Katip, president of Grace College and Seminary. “Her wisdom on the Campaign Cabinet and ongoing guidance to pre-med students is invaluable. We are a stronger institution because of her involvement and support,” he said. Geisler’s level of support and commitment to Grace couldn’t have been predicted when she enrolled as an undergraduate, planning to stay for just one year before transferring to pursue medicine elsewhere. But she was wooed by the community of faith and rigorous biology department, and as a result, her plans changed. Although Grace wasn’t known for its pre-professional medical degrees at the time, the preparation Geisler says she received was outstanding. “I was attending Indiana University School of Medicine’s courses with students from Big Ten universities who didn’t have the familiarity with the subject matter that I did,” she recalls. After graduating from medical school at Indiana University in 1994, Geisler was named Chief Resident in 1998 during her residency at Medical School of Ohio (Toledo, Ohio). She then went on to specialize in gynecologic oncology when she was awarded the Gynecological Oncology Fellowship at the University of Michigan, becoming the first student from the Medical School of Ohio to pursue the field of gynecological oncology. Geisler demonstrated her exceptional aptitude when she was awarded the prestigious Galloway Fellowship in Gynecology at Memorial Sloan-Kettering Cancer Center and was named Outstanding Resident during her training. A lifelong learner, Geisler earned her MBA from the University of Georgia in 2017. She now works as director of gynecological oncology at Cancer Treatment Centers of America in Atlanta. Light has served as the CEO and executive director of Kosciusko County Community Foundation (KCCF) for more than two decades, cultivating a culture of philanthropy that has grown the foundation’s assets from $400,000 to over $57 million. In 1994, Suzie attended the inauguration of Dr. Ron Manahan as Grace’s president. It was one of her first official functions after joining KCCF in 1993. Her first project with Grace happened one year later when KCCF had a donor who wished to support the renovation of Westminster Hall. As she witnessed Grace’s growing desire to support, serve and partner with the county, Light’s respect for the institution swelled. “I’ve seen the change in Grace College and its presence in our community. The success of the Aspire Campaign and the visioning, planning, and intentionality of Grace connecting to its community is one of the reasons my husband and I are donors,” said Light. Most recently, Light has served as the impetus for the creation and expansion of the Lilly Center for Lakes and Streams. The center’s beginnings are rooted in an email Light sent to Manahan back in 2006, when she inquired whether Grace might be interested in meeting a donor’s request to measure and monitor the water quality in the county. “Thank heavens Dr. Manahan said, ‘Yes!,’” recalls Light. Light continues to inspire and support Grace, serving on hiring committees, offering input in strategic planning efforts and assisting with campaign strategies. “Her love for helping others get joy out of giving inspires my own fundraising efforts,” said Katip. After graduating from Grace in 1961, Minnix spent the majority of her career serving at Women of Grace USA (WGUSA), a national ministry of the Charis Fellowship (formerly Fellowship of Grace Brethren Churches) for 30 years — the last 17 years as president until she retired in 2014. Additionally, over the past 12 years, Minnix has served on the Grace College and Seminary Board of Trustees. “Serving on the board gave me an opportunity to repay in a small measure what I received from Grace many years ago,” said Minnix. Further, it gave her an opportunity to encourage and support Dr. Christy Hill, Grace professor of spiritual formation and women’s ministry. During her tenure at WGUSA, Minnix, with the support of Hill, forged a partnership between Grace Theological Seminary (GTS) and WGUSA to help develop classes that would take seminary training to women in churches around the country, equipping them for effective ministry leadership. “I believe strongly in the importance of women receiving a theological education, and so, I worked with Dr. Hill to develop a series of weekend classes to enable women to receive a continuing education certificate from GTS,” explained Minnix. Those six weekend classes, in turn, served as the building blocks for what would become the Women’s Leadership Studies concentration of Grace’s Master’s in Ministry Studies. Although Minnix recently finished her term on Grace’s board, she says she has no plans to cease supporting Grace. “I will continue to support Grace financially because it holds true to the authority of Scripture, recognizes the need to add to or adjust curriculum to meet the demands of a changing world, and its faculty and administration truly care about each individual student,” Minnix said. In 2017, Minnix earned her Master of Arts in Ministry Studies with a concentration in Women’s Leadership Studies — formally taking courses built on the concepts and structures she and Dr. Hill had developed just five years earlier. After earning his bachelor’s degree in accounting in 2008, Lee began his career with RSM, a national firm specializing in tax, audit and consulting services. In 2011, he joined Kruggel Lawton CPAs as a senior staff accountant. Lee was named to Kruggel Lawton’s strategic planning team, where he helped determine the firm’s values and business goals. Preserving and perpetuating the firm’s culture is one of the reasons Lee is passionate about his job. Lee won the statewide Emerging Leaders Award from the Indiana CPA Society in 2016. He’s also developed a niche practice area at the firm in fiduciary tax services, which focuses on trust and estate tax compliance and estate planning, and has directly contributed to the firm’s growth — Kruggel Lawton has doubled in size over the past five years. Dan and Renee are the proud parents of Lauren Keiser, who was Grace’s first female golf recruit four years ago. “My parents have supported Grace from the day I decided to make this place my second home,” says Lauren. In the past four years, Dan and Renee haven’t missed a single one of Lauren’s tournaments. “We are crazy Grace Women’s Golf fans,” confesses Renee. “We have loved being a part of this team.” The Keisers have hosted the women’s golf team for numerous tournaments, eagerly helped Coach Duncan in recruiting efforts and participated in various golf fundraisers for the team. Dan and Renee have also utilized their business, Keiser Design Group (KDG), to serve Grace. Dan, the principal architect, founded the firm in 1995, and Renee serves as the director of business management there. Not only has KDG consulted on various construction projects on campus, but it also donated design services for the indoor golf practice facility.